The moral and legal implications of traffic cameras are still hotly debated, but it seems Illinois residents may as well get accustomed to these robotic enforcement mechanisms. Illinois is one of only twelve states that permits the use of both speed and red light traffic cameras for ticketing purposes. Given the questionable nature of this practice, there are a multitude of Illinois regulations and policies regarding the use of traffic cameras currently in place. It may be necessary to seek legal advice in order to decipher the jargon surrounding the use of traffic cameras if you receive a ticket in the mail from the Illinois Department of Transportation. Traffic cameras are present on many major Illinois roads and highways including right here in Joliet and the greater Chicago area. 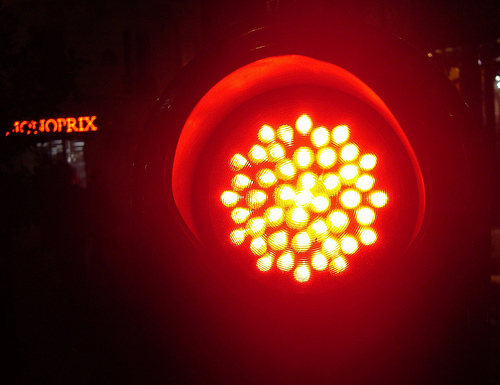 The most common traffic cameras currently used are to enforce red lights. These cameras work by taking a snapshot of each vehicle’s license plate who is detected driving while the traffic light is red. Though in place for public safety and traffic law enforcement, these cameras have brought criticism from citizens around the state, as to both their efficiency in targeting actual violators and their infringement on the individual rights of Illinois’ commuters. Cameras used to ticket individuals for speeding on Illinois roadways are used almost exclusively in construction areas and on toll roads, with certain exceptions. These cameras are similar to traditional police speed radars in their ability to clock your vehicle’s speed and record the data very quickly. This technique allows for much broader enforcement of speeding laws that may be beneficial to the state in increasing ticket revenue but a hassle to Illinois drivers, who fall the unsuspecting recipient of a speeding ticket. Fighting camera enforced traffic tickets can be quite difficult, as is the case with any minor traffic violation; however, there are defenses and precedents where Illinois motorists have been cleared of all charges. Possible defenses include proving you were not the driver of the ticketed vehicle, arguing against the accuracy of the cameras reading, or showing that you failed to receive timely notification of the violation in question. If one of these examples pertains to your situation or if you believe that you have been wrongly ticket via an automated ticketing system, you may be able to win your case. If you’ve been charged with a traffic ticket via an automated traffic camera, the office of David Freidberg can assist in defining your legal rights and courses of action. Our experienced criminal defense attorneys are here for you. We will use our knowledge and expertise to guarantee the best outcome possible outcome for you, whether facing a simple traffic violation or a serious infraction.